The Brazilian miner is prepared for an iron ore fight, no matter what happens to commodity prices. Vale's S11D. Image source: Vale. Vale SA (NYSE:VALE) is one of the world's largest iron ore producers. Its stock took a huge hit when commodity prices started to fall, rebounded early this year as iron ore prices headed quickly higher, and has come down again now that the steel-making input has cooled anew. But here's the thing: The company recently announced it's prepared to fight no matter what price iron ore fetches. The [iron ore] price less than one month ago was more than $70. When you come back three months ago, it was $38. This shows there's a big volatility. Since that point, iron ore has cooled again. In fact, Alves summed it all up nicely when he said, "We had a good taste of the kind of volatility that we can experience in the future." But here's the real takeaway: According to Alves, Vale is "prepared to operate at any price level because we'll be on the left side of the curve." He's talking about the cost curve and basically saying that Vale has been working hard to ensure it is one of the world's lowest-cost iron ore producers. For example, in the first quarter, the miner reported that it was able to reduce its cash costs per metric ton by roughly 35% year over year. Clearly, Vale isn't alone in working to trim its costs amid low iron ore prices. For example, Rio Tinto (NYSE:RIO), another of the world's largest iron ore producers, reported that its cash costs for iron ore fell around 24% last year. So companies throughout the industry have been adjusting to the low prices. But that's yesterday's news; the bigger thing to watch is tomorrow. And Vale is going to make tomorrow harder for everyone with its massive S11D project. The mine and plant at this investment are roughly 85% complete, as is a railway spur that will serve the mine. Lagging a bit behind are logistics sites, which are around 65% complete. S11D is projected to be among the lowest cost and most productive iron ore mines in the world. Alves expects S11D to produce around 30 million metric tons of iron ore next year, with a ramp up to 80% of capacity in 2018, and full capacity coming in around 90 million metric tons, in 2019. To give you an idea of the scale of this project, Vale produced around 65 million metric tons of iron ore in the first quarter. The company believes this project could push its cash costs to as low as $10 a metric ton. A good part of that reduction will come from shifting production from higher cost mines to S11D as the new mine comes on line and ramps up. Another S11D image. Image source: Vale. But adding capacity during a downturn is likely to have a negative impact on iron ore prices. After all, it's too much supply and too little demand that's causing so much pain today. So, in some ways, Vale is adding to its own troubles. It's just that the troubles for miners with higher costs will likely be worse. So Vale is playing into its own strengths and hitting competitors where they are weak. 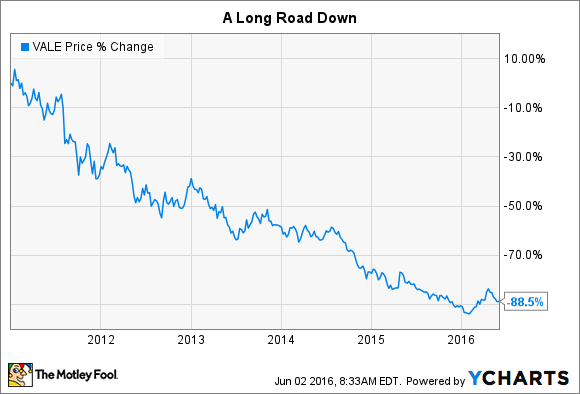 Will it knock companies like Rio Tinto out of the game? Not likely. But if prices remain volatile and relatively low, as Vale adds to the supply overhang in the iron ore market over the next couple of years, marginal miners could easily find themselves in a life-or-death situation. Advantage: Vale. Vale could be an interesting investment option in the iron ore space, but you'd better have a strong stomach, because it could get worse before it gets better on the supply and-demand front. And don't forget that Vale has some company-specific risks you'll want to think about, most notably its 50% interest in the Samarco mine, where mining waste flooded nearby towns, killing a number of people. The legal issues have only just begun there. That said, if you are a contrarian looking for an iron ore play, Vale is clearly preparing for a fight in the iron ore industry -- no matter what the price of iron happens to be.